It is worthy of note that those campaigning for these United Kingdoms to Remain a vassal region of The EU have not produced any forward vision or sound reasoning for us to Remain in The EU beyond FUD and a pack of lies about Britain having a special New Deal with The EU and the EU being Reformed – if ever there was a leap in the dark a greater one could hardly be presented! Surely the voters can not be so timerous and stupid as to be beguiled by the nonsense from the Remain campaigners and a promise to remove v.a.t. on tampons and female hygene requisites -n surely that can not be the measure by which we are to sell our heritage, our Sovereignty and our future – debasing the mother of Parliaments at Westminster to little more than an administrative local council of the EU! To achieve a trouble-free exit, we must have an exit plan. Without that, we believe the “leave” campaign will not succeed. But we expect our plan to have more than just an effect on the campaign. It would have a direct impact on the subsequent negotiations, if we decide to leave. Behind the scenes, having been deliberately shunned by the major campaign groups and the media, that idea has already gained considerable traction. Thus we get the Telegraph today reporting that, “according to one analysis (i.e., Flexcit), developing a Britain-specific deal is likely to take five years, running way beyond the two-year period between a country triggering the Article 50 exit clause and it being released from the European treaties”. “As such”, the paper says, “it is likely the UK would adopt a model similar to Norway’s as holding position, before gravitating to a more bespoke arrangement, according to one scenario under discussion” – the scenario posited almost exclusively by Flexcit for the past two years. This reflects a crucial point in our plan – that negotiations will not take place in a political vacuum. Nor will they start with the formal exit talks. Rather, they will be continuation of a political process that will have started well before the referendum. This means that our negotiators will not have a free hand. Theirs will not be “blank piece of paper” exercises where shopping lists are drawn up without restraints. Nor will there be room for theoretical assumptions. Negotiators will have to deal with the political realities of the day. And they will be forced to respond to the limitations imposed on them. In our view, that means we must – in the short to medium term – stay in the EU’s Single Market. However, the EU has made it abundantly clear that if we want to stay in the Single Market, acceptance of the principle freedom of movement is non-negotiable. We can abolish freedom of movement or we can stay in the single market. We can’t do both. On that basis, we have come to the conclusion that, in order to leave the EU and secure the medium and long-term gains that accrue from so doing, we must accept a short-term compromise over freedom of movement. That confronts another reality. Brexit presents an existential threat to the EU. If it concedes an exit deal to the UK that is better than it could achieve within the EU, other Member States might be tempted to leave. A “better deal for Britain” could collapse the entire EU. For that reason, it will never be offered. Stage one: this deals with the immediate split, for which there are several broad possibilities. There are the options we set out in the of what we also call “The Market Solution”, there is what we call the “Swiss” (bilateral) option, or there is the World Trade Organisation (WTO) option. Our first stage comprises three options, all aimed at ensuring continued participation in the single Market. First is the “Norway Option” in which we rejoin the European Free Trade Association (EFTA) and trade with the EU through the European Economic Area (EEA). We will need to take action at a global level to deal with third country immigration, seeking amendments to the Geneva Convention on the Treatment of Refugees, and the 1967 Protocol. We will also have to change or withdraw from the European Convention on Human Rights. We can also limit immigration from the EU by addressing the “pull” factors that make it so attractive to come to this country. What we want is a community of equals in a “European village”. To administer the market, we propose replacing Brussels with the Geneva-based United Nations Economic Commission Europe (UNECE), on the lines proposed by Winston Churchill in 1948 and again in 1950. UNECE already plays a prominent role in global regulation and trade and is the logical choice. Stage four: is one of rebuilding independent policy. Illustrating how an independent UK might operate, we look at foreign and defence policy, agriculture and fisheries. We also explore environment policy, and then the linked subjects of climate change and energy. We conclude with financial services and the so-called “digital market”. 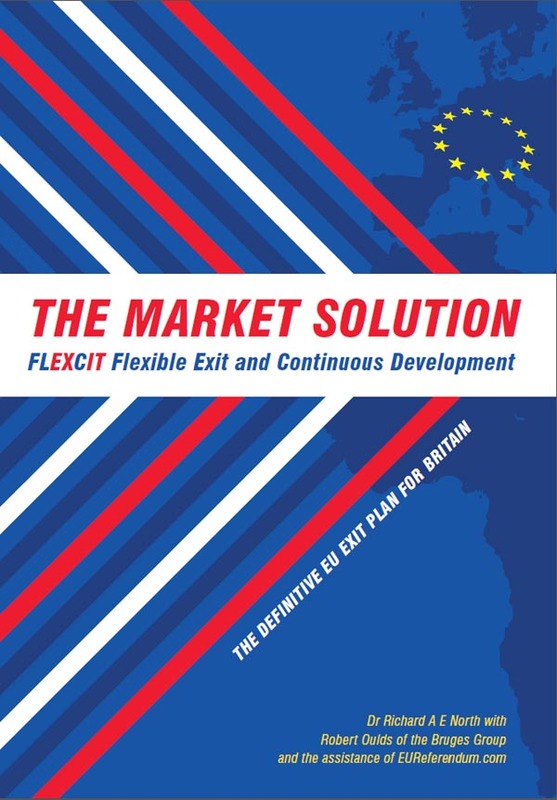 In conclusion, we explain how leaving the EU becomes a process requiringcontinuous and flexible development – from which Flexcit takes its name. That repeats our central point: leaving the EU is not a single event but a multi-stage process. Even after we have left the EU, the process may take many years to complete, as we seek a steady, measured divergence rather than a “big bang” separation. The aim will be to keep the best of our agreements with the EU while freeing it to follow its own path. Previous Previous post: Taking IDS’s Lead May Other Senior Tories Start To Tell The Truth!